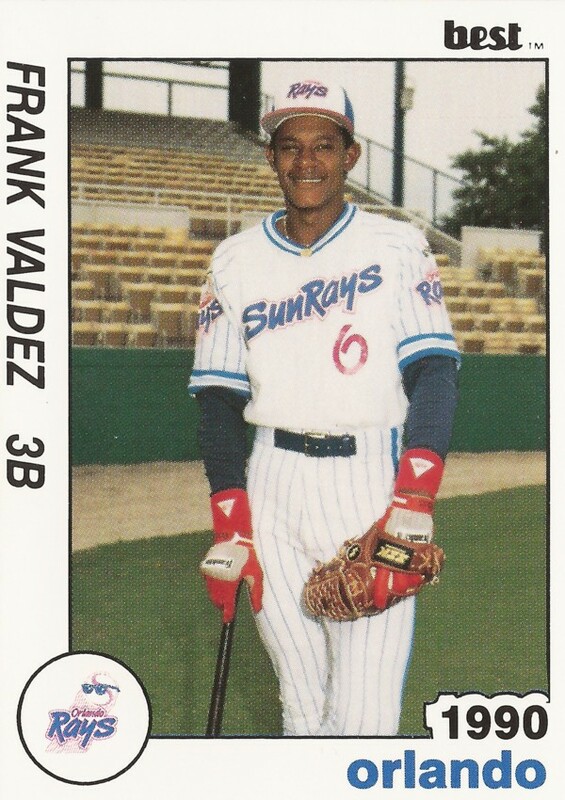 Frank Valdez got off to a hot start for the Orlando SunRays in 1990, getting two early two-run home runs and making tough plays in the field, all in the SunRays first two games, according to The Orlando Sentinel. Valdez was starting his fifth season in professional baseball. He would only get one more in affiliated ball, never getting above AA. 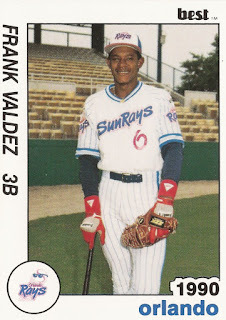 Valdez was originally signed by the Twins in March 1986, out of his native Dominican Republic. He played that year and the next at rookie league Elizabethton. He hit .200 in 16 games his first year and .229 in 61 games his second year. He made single-A Kenosha in 1988 and then Visalia in 1989, his hitting improving to .278 and then .283 at Visalia. He also hit 10 home runs in 1989. But he did earn a promotion to AA Orlando for 1990, and got off to that hot start. In one August game, he was credited with two hits. But he only hit .233 on the year, and was credited with only one more home run, winning a June game in the top of the 11th. And, while there was praise at the start for Valdez' glove, there was also criticism in August. Valdez was one of two players to misplay balls behind Orlando starter Doug Simons. He returned to Orlando for 1991, hitting .247 with two home runs. He had three singles and two RBIs in one June game. He played in 60 games in total, on injured reserve for a portion of the year. He came off in late July. One of his home runs came July 27, in an Orlando loss. But it was Valdez' final year with the Twins and in affiliated ball. He returned to playing in 1993, with the independent Sioux City Explorers, his first of five seasons playing in independent leagues. He signed with Sioux Falls for 1995, then Palm Springs in 1996 and Pacific in 1998. In his final year playing, in 1998, Valdez began the year going 11 for 17, before going down with a leg injury, according to the Los Angeles Times. He later helped his Pacific team to a rare win in August with a two-run double. As August ended, and his career neared its end, Valdez smacked three hits, one of them a home run. He finished the year with a .341 average, ending his career.